A friend of mine came to me the other day wondering what he could do to help him fall asleep at night. I told him the simplest, safest, cheapest and most effective thing to do is drink chamomile tea about half and hour before bed. A few days later I ran into him again and asked if it worked. “No.” he replied sadly, “I guess I’ll just resort to drugs.” Argh. I really hate hearing people say that, especially after one of my recommendations. I asked him whether or not he had covered the tea while it was steeping and he said no. “Well that’s why it didn’t work!” I exclaimed. “All medicinal herbs contain volatile oils which give them their ‘magical’ properties. When you steep tea without covering the cup or using a teapot, the volatile oils will escape in the steam, rendering the herb useless.” He was astonished as he had never heard that before and said that he would go home that night and try it. The next day he told me all about the miracle of chamomile tea as if I didn’t already know. “I fell asleep in a matter of minutes! It was incredible! Why don’t they put directions on the package?” Good question. The moral of the story is to always cover your tea when steeping (about 10-15 minutes for herbal / medicinal tea) in order to take advantage of those precious volatile oils that you spent your hard-earned money on. Otherwise you’ll just be drinking tasty hot water and lying awake all night! I always like to buy tea in loose-leaf form and the whole flowers themselves, instead of the bags. Whole tea leaves and flowers are of much higher quality than the tea you can buy in bags. If you break open a bag of tea you will notice how it’s filled with something that resembles dust. That is literally the bottom of the tea barrel where the leaves have been broken up so much; all the natural oils have left the leaves and dried up, which is why they are so inexpensive. 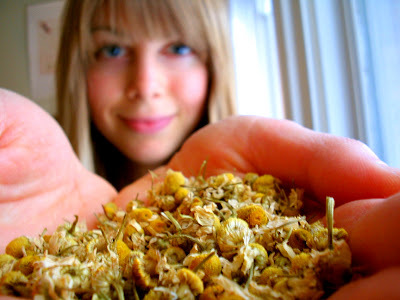 Whole tea leaves and flowers can be purchased at your local health food store, often in bulk. 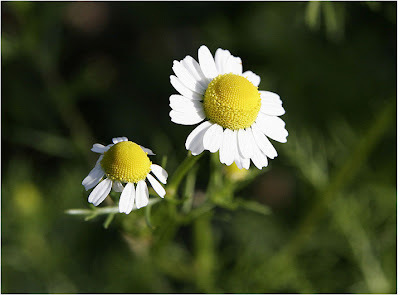 Chamomile flowers (pictured above) look very similar to daisies and when they are dry, the petals fall off and the bright yellow centers are clearly visible. The smell and flavour of the real thing is truly mind-blowing. And I promise, in the case of chamomile, you won’t stay awake long enough to tell anyone about it. What is the best way to cover your tea if you don’t have a pot or a thermal cup with a lid? I often boil water first and then pour it into a mug after a couple minutes and I have to find something with a flat surface to stick on top to keep the steam from escaping, but when I take it off it’s hard to get all the moisture that accumulated on the flat object back into the tea cup. I feel like that steam is going to waste anyway. Thoughts? I’ve never been a fan of chamomile since years ago when I tried some in teabag form. Since then I have changed from tea bags to loose leaf. The difference is amazing; however, I’ve never thought to revisit chamomile using flowers nor have I ever thought of oils escaping through steam. I have always been amazed by the medicinal properties that nature provides. I cannot let a few bad bags of tea deter me from enjoying a good cup of chamomile. Is it okay to reheat the tea after steeping? Cause after 10-15 min the tea would be too cold for my liking ..
You’re blog is wonderful and I’ve learned so much from it! If you think the tea will be too cold after 10 minutes, wrap it in a tea towel until you’re ready to drink it. thank you so much for this tip! for years i have had such trouble sleeping and i bought chamomille tea (the whole flowers!) a long time ago. it always makes me relaxed, but it hasn’t made it easier to fall asleep, so i am eager to try this out. i can’t believe i haven’t heard about this. i had also never heard about soaking nuts and seeds before eating them. thanks! My daughter had told me that tea in bags were the bottom of the barrel so I started buying whole tea leaves but I did not know about steeping with the lid on. It’s okay if you’re making a pot,, but alot the time I’m just making tea in a cup. I’ll have to pass this message along to her. Thanks for the tip.